One moment is too many. There are many songs throughout the past century that have earned the title of a "classic", spanning every genre, from rock to country to electronic music. In the world of trance, there are an equal number of tunes considered classics, from Vincent de Moor's "Fly Away" to Veracocha's "Carte Blanche", from Sasha's "Xpander" to Energy 52's "Café Del Mar". 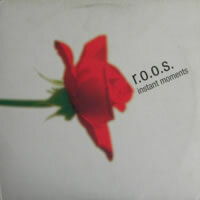 One classic tune that has a mild cult following is "Instant Moments" by R.O.O.S., the duo of Benno de Goeij and Piet Bervoets, who would later work under the more popular moniker of Rank 1. This was their very first song produced together, which jumpstarted their long career in the genre. It's surprising, really, because this song is, in my opinion, boring garbage that should have remained on in their demo folder. The version most tranceheads would remember is the Moederoveste Onie Mix, which translates to "Mother Superior... Onie Mix". (Thanks, Google. That sort of helped.) Imagine an extremely repetitive, uncreative two-note melody that lasts a little over a second in length, repeated ad nauseum for several minutes with as little auditory variation as they can legitimately get away with. That's the song: an annoying tubey ringtone with a metronome clacking away in the background and some other generic 1997 trance percussions/ This is the kind of music that is played in continuous loops to torture prisoners into confessions...and it works within five minutes. There are two more mixes on the original release, including the Original Mix. Though there's no change in melody (sadly), there are more variations in instrumentation, notably a more pronounced bassline that actually briefly serves as the melody itself, as well as a brief space-laden, empty, twinkly interlude trying to break up the otherwise extremely repetitive nature of the song. Still pretty darn awful, but slightly more tolerable. We also get the Dance Therapy Mix. I had high hopes that perhaps an outside point of view could actually add depth to this otherwise dank hole. From the beginning, it seems as thought there's really not much difference, aside from a slightly funkier beat and a few little special effects here and there. Eventually, this strange fake trumpety overlay pops in to add that extra depth. It's not much, but even the most minor of adjustments is an improvement. Still, it's not enough to make us forget that the original song was an ear infection, as it really only adds one element for part of the song, otherwise leaving things as they were. It really makes you wonder what "dance therapy" is. I'm glad these are "instant moments" because if these moments lasted forever, I'd probably need a long sabbatical from music.